The opening of the Manalapan branch now gives NJ Lenders their 11th office, including their 8th located in New Jersey. 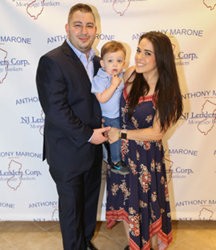 NJ Lenders Corp. recently celebrated the grand opening of their newest office located in Manalapan, New Jersey. On June 4th, Branch Manager and Loan Officer Anthony Marone hosted realtor, title agents, insurance agents, and financial planners at the new office for a day filled with food, drinks, and celebration. Marone, who is a Certified Mortgage Planning Specialist (CMPS), Certified Military Housing Specialist (CMHS) and a Certified Divorce Lending Professional (CDLP), had many colleagues attend the grand opening of the office in show of support. With Marone’s expertise and knowledge, the Manalapan office can help clients determine the absolute best loan program to meet their financial objectives and goals. NJ Lenders takes pride in working with first-time home buyers, seasoned home owners, builders, and realtors. Marone, himself, is an expert that specializes in originating the Police & Fire Mortgage for New Jersey’s Police Officers and Fire Fighters. The opening of the Manalapan branch now gives NJ Lenders their 11th office, including their 8th located in New Jersey. Their other office locations in the Garden State include their corporate office in Little Falls, as well as Hoboken, HoHoKus, Mahwah, Morristown, Shrewsbury, and Toms River. The company also has offices in Hampton Bays, Smithtown, and Staten Island, New York. The new office is located at 270 Route 9 North, Suite 600 in Manalapan. About NJ Lenders Corp Founded in 1991, NJ Lenders is a leading NJ-based residential mortgage banker that is privately owned and licensed. The company currently originates first mortgage loans in NJ, NY, CT, PA, VA, MD, and FL. With 11 offices and over $25 billion in closed mortgage loans, many of their Mortgage Loan Originators are recognized nationally as the best in their field. The company has competitive rates and fees with a wide variety of mortgage programs to select from.